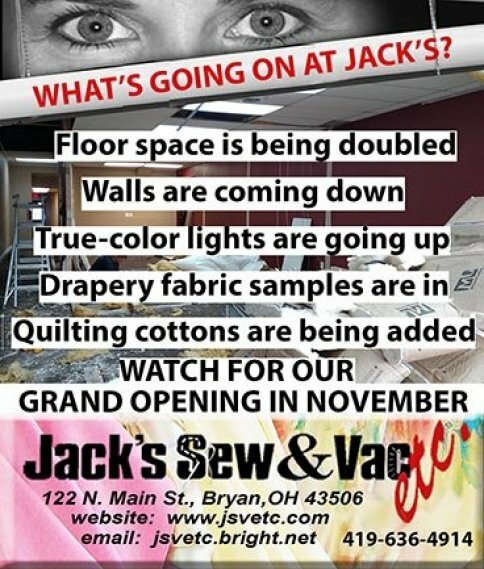 Jack's Sew & Vac, etc. has purchased the building adjacent to their present location's north side and contractors will soon be breaking through the wall to make the two stores into one. We willl be adding an expanded line of quilting fabrics, tools and supplies as well as drapery fabrics and hardware, window shades and blinds. Follow us on our new facebook page, www.facebook.com/JacksSewVacBryan2016, for updates.